Enjoy Whale Watching in San Diego. See Gray Whales as they Migrate along the San Diego coast to and from Baja California. From December through mid April, over 25,000 California Gray Whales undergo their annual migration from Alaska through San Diego and onto Baja California. As the gray whales migrate south, they travel in large pods that are relatively close to the San Diego shore. If you choose a San Diego whale watching cruise or sailing adventure, you can see the whales and get close enough to watch them as they travel south. The whales will pause and play occasionally, breaching and sending huge sprays of water (in fact, that might be how you spot them). The season runs from December to April, but occasionally you can see them at other times. Last October we saw 6 whales from shore near Swamis. Most sightings occur within five miles of the San Diego beaches during the early part of the season, so if you want to see them from a kayaking tour, or from land, go from December to February. In the latter part of the whale watching season, the grey whales are migrating north from Baja Mexico on their way back to the Bering Sea. During this time, they often travel further out to sea and in less concentrated pods. The Whale Watching excursion boats will travel further out to see them. When you are whale watching in San Diego, you may be joined by playful dolphins. You may also see seals swimming or lounging on the buoys near the San Diego Harbor, or on rocks in La Jolla Bay. Naturalist-Guided Whale Watching Boat Rides - mid December through mid April San Diego Harbor Excursion. Go whale watching in San Diego with an ocean expert from Birch Aquarium at Scripps. Amazing views, listen to whale and dolphin sounds, and guaranteed whale sightings. Reservations required. (619) 234-4111. Times 9:45 am - 1:15 pm and 1:30 pm - 5:00 pm. Tickets cost approximately $38 weekdays and $43 weekends, kids 4-12 $19 - $22 with paid adult, kids 3 and under free. Get a coupon and save $5 on Whale Watching at www.aquarium.ucsd.edu. Whale Watching San Diego Sailing Adventure - Sail aboard the America, one of the most famous racing sailing vessels in the world. They should offer this great adventure again for the next whale watching season. 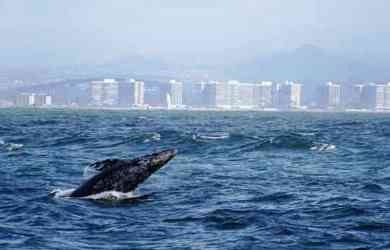 See some gray whales up close - guaranteed. The sailboat departs from the San Diego Maritime Museum, where you can visit either before or after your sail. No seasickness guarantee too, and no diesel engine smell as this is a sailing trip. Bring your own picnic lunch. Watch for whales aboard the replica of the 139-foot yacht America. Ticket prices for adults approximately $65 - $85 per person, kids $34. Boarding starts at 10:30 AM. For more information call 800-644-3454 or visit the SD Maritime Museum Whale Watching website www.sdmaritime.com . Hornblower Cruise and Whale Watching Adventure Hornblower Cruises at 1066 N. Harbor Dr. in San Diego, also offers San Diego whale and dolphin watching cruises daily at 9:30 AM and 1:30 PM in December through mid April. This year you can also combine them with admission to the Maritime Museum, USS Midway, or the San Diego Natural History Museum. No outside food may be brought aboard, but food and beverages may be purchased while on the cruise. Ticket prices vary depend on age and package, with cheaper prices on weekdays. 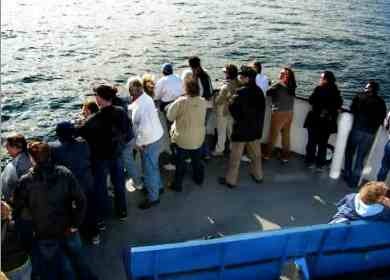 For more information see Hornblower San Diego Whale Watching. See ideas on San Diego whale watching discounts and coupons. Another interesting way to see whales up close is from a kayak in La Jolla Bay. The whales frequently travel along the canyons off La Jolla, and the clear waters offer some excellent views of life below the surface. These small group tours run from December to March and cost approximately $70 per person for single kayak, or $55 per person for double kayaks. Wet suits are recommended and can be rented for an additional $10. Ages 8 and up, swimmers only for this San Diego whale watching adventure. Whale sightings are not guaranteed, but kayaking in La Jolla bay is a wonderful experience even if you miss the whales. There is so much else to see! For more information on La Jolla Kayak Whale Watching Tours see www.hikebikekayak.com. Torrey Pines State Preserve in La Jolla, Cal. I've seen whales and dolphins here many times as I hike along the trails near the cliffs. Birch Aquarium at Scripps where the whales migrate along one of the deep underwater canyons close to shore. Birch Aquarium offers some programs such as Whales on the Horizon where you can watch for gray whales during their migration from the aquarium’s tide pool plaza, get up close to real whale baleen and learn more about whales from Scripps Aquarium scientists.